Welcome to the fifth Friday in the month when we have a very special extra post for you. 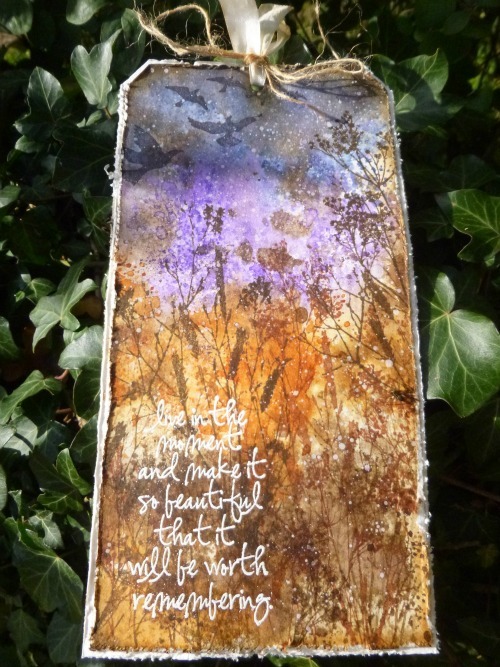 As always the mega talented Guides have been creating and making tags for your perusal - there's no theme, no expectations for these to fit with our current challenge, just pure, sheer unadulterated go where the muse takes you inspiration pieces. Let's take a look. 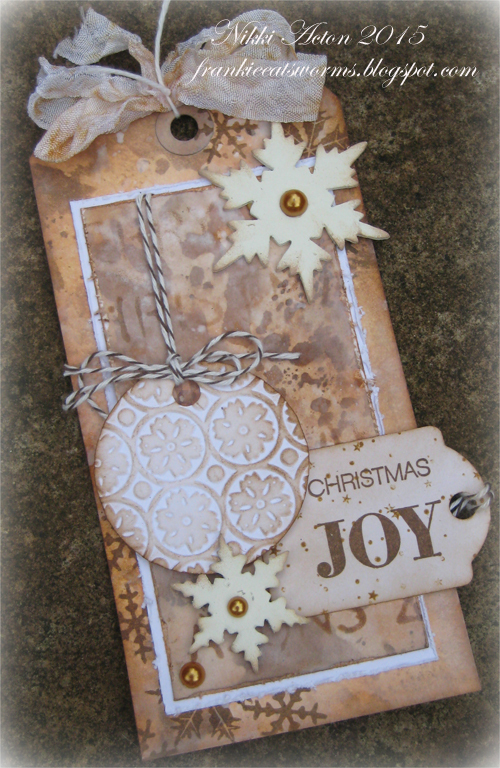 For this month's tag I had some wrinkle free fun with a range of brown distress inks, including Ground Expresso. Do pay a visit to Addicted to Art for more details today. 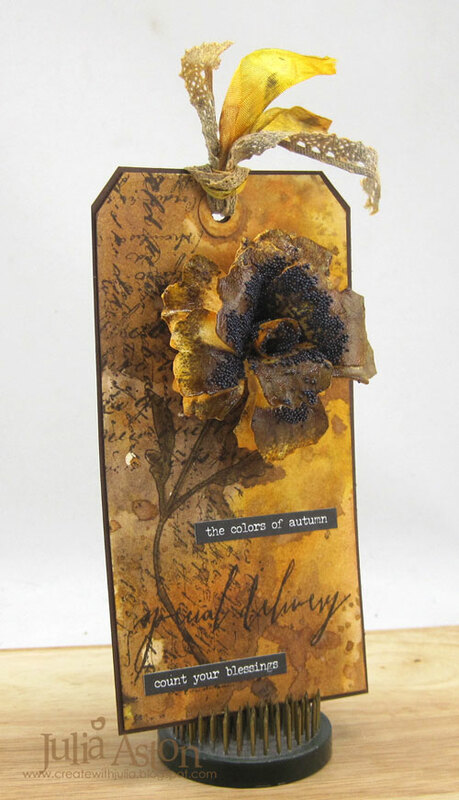 I made a simple autumn tag for the AVJ October Tag Friday - with a glorious fall rose I made using my fellow Creative Guide, Jennie's, marvelous tutorial! I inked my tag with 3 different Distress Inks spritzed with water. I stamped the Ledger Script on the side along with a stem from Flower Garden and sentiment from Handwritten Sentiments. I finished my tag with two Small Talk stickers and two colored trimmings at the top! You'll find many more photos and details on my blog Create with Me if you'd like to take a peek! I do love a Tag Friday and the chance just to play! I'm still working through my love of Wilted Violet as an autumnal shade and the sharper-eyed amongst you will notice that this tag reworks ideas from some of my recent projects - combining a tag I really enjoyed making and my art journalling pages for this month's Art Journalling With Tim theme. Come over to Words and Pictures if you'd like to see more. 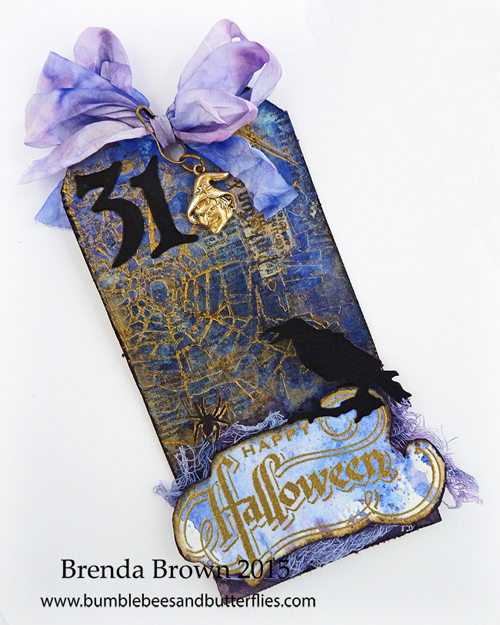 Knowing it's the weekend of goblins and ghouls and a night of fright I made a rather regal coloured tag using mauves, blues, gold and black to wish you all a Happy Halloween. 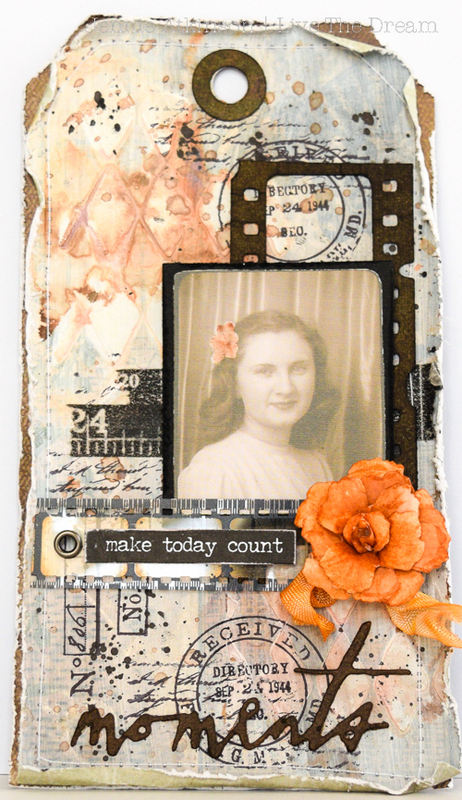 I love being able to have the chance to play with something new and for Tag Friday had an idea in my head of working with a single colour and black and vintage brown. 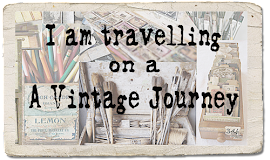 I am not sure the end result was what I intended but it was an interesting journey! 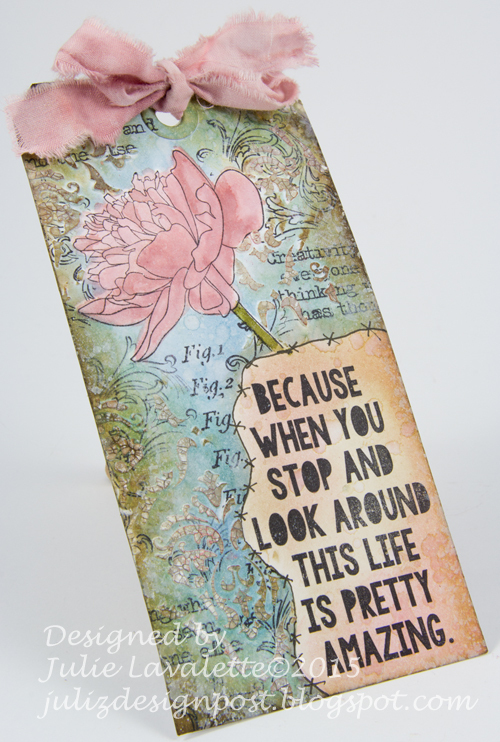 I am loving the new Tattered Florals Punch! Please join me on my blog if you want more details of the tag and flower. What a perfect excuse to make a fun Halloween Project. 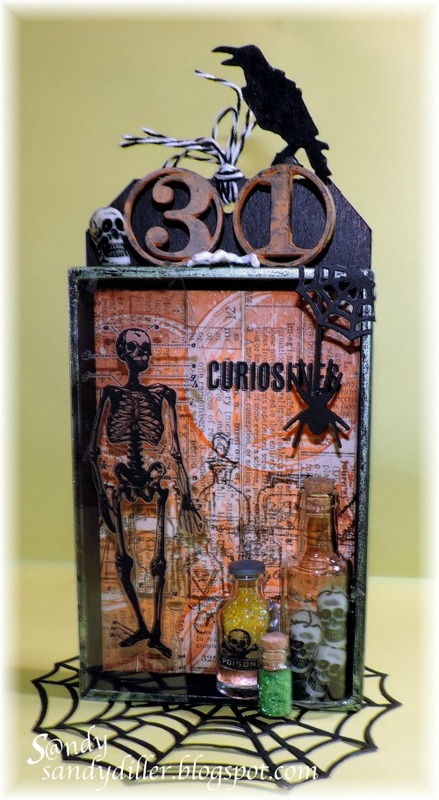 Such great colors and spooky embellishments. You can spot Tim's influence and products all over this 3D tag. This is a simple way to use up those left over Configuration Boxes from other projects. 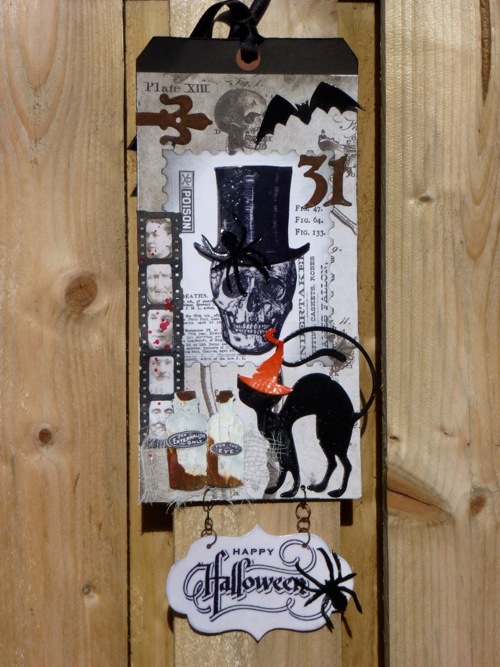 Hope you have a spooky Halloween and I'd love to see you over at my blog "My Crafty Life On The Internet". My tag today uses many different Tim techniques. 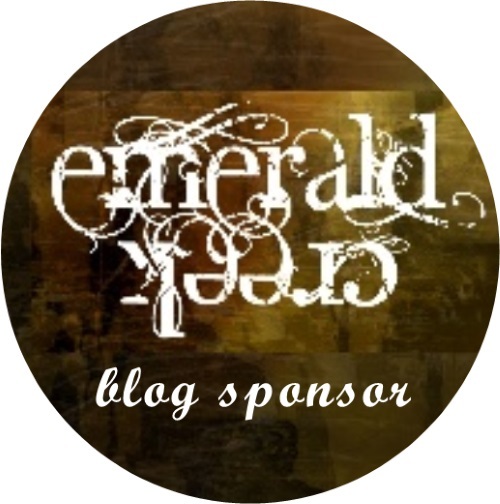 I would love to have you stop by my Blog - Juliz Design Post to see how I achieved the illusion of layers. Thank you to all the Creative Guides who have shared their latest tag make, as always it is an incredible line up of talent. 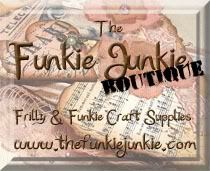 I hope that each you enjoyed looking at the wonderful range of designs and ideas. We wish you all a happy Halloween weekend full of ghoulish fun with lots of treats but without the tricks. Great job from the entire team. So nice to have a reason for an extra project. Happy Halloween Weekend to All. Fab tags from you all teamies!! Can't wait to check out the details later! Stunning creative tags and all so very different. Fabulous step by steps too. Great tags all round... looking forward to taking a closer look. Just "discovered" this Friday tag post . . . so happy and will now look forward to it! Thanks! Beautiful inspiration from you all! Thanks!